Lot of excitement these past few days. By some miracle – maybe the 10,000 downloads on our KDL free promo wekend – we got into Amazon UK’s 100 books for under 2.99 for June with Looking For La La priced at 99 pence all this month. Suddenly Pam was calling me every hour – we were #8 on the list, wait… we were #6, then #5, then #4. Ahead of some big names too. And our Amazon rating had changed too – from being somewhere in the stratosphere… ranked 30,000 or 300,000… 3,000,000… or whatever it was, we’d jumped into the Top 500, a never before achieved feat for us. And with a self-published novel. Doesn’t sound impressive until you realize how many books must be in that list. Then we were at 312, then in the Top 200, then suddenly we were in the Top 150 at #146. Will we break into the Top 100 before the promo ends? It remains to be seen. The initial rush has slowed down, we’ve slid back to #180 but there is still the rest of the month ahead. And our Amazon US ratings have improved too. Oh, if only some of those people who bought La La or downloaded it for free would review! People always think they need to write an essay or a book report – remembered horrors from school – but even a few words that meet Amazon’s minimum work fine. Also wanted to spread the news about our new GIVEAWAY on Facebook, offering both an ebook and a paperback copy of Looking For La La. It’s so far gone undiscovered – only 10 entries as opposed to 800 on our last Goodreads giveaway. So anyone who enters has a great chance of winning. All you have to do is like our Facebook page and sign up. Of course if you’re a UK kindle owner, you can spend the 99 pence and not wait for the drawing but what fun is that..! Thinking about reviews and school book reports reminds me… I was always an avid reader, finished all the required books for English within a few days of getting the list, devouring four J T Edson westerns in a day (he wrote dozens and the cool handsome heroes rode great horses), sped my way through all of Jane Austen, Agatha Christie, Dorothy Sayers plus the bodice rippers of the time (anyone remember Forever Amber?) and anything else I could get my hands on. But book reports… hated ’em, loathed doing them with a passion. The bane of my existence. (Well, actually all homework came under that category.) Used to copy from my friend during tutorial. And what did I end up doing in my publishing career? Book reports, book reports and more book reports. For the literary agency I worked in, for Woman magazine reading novels for serialization, for Penguin books as a reader, for the Book of the Month club, also as a reader. And now when I review a book, I still struggle over what to say… even though, as I said, I’m well aware it doesn’t have to be a work of art or even very clever. But then again I can never think of what to say on birthday or sympathy cards either. A problem I share with Cathy O’Farrell in Looking For La La. Anyway that’s it for now. Beautiful day in sunny Colorado. Had what I hope was our last major snowfall about 3 weeks ago and now we are plunged into summer. And I hope to join our local swimming lake and plunge into that. Fantastic! A nice 5 star review from WiloveBooks. 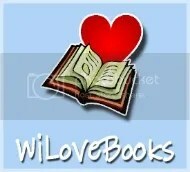 Wilovebooks, we love you too! My Thoughts:A fun read with some serious parts. When Cathy’s husband gets a postcard that is signed with love from La La Cathy is excited at the prospect of figuring out the mystery. The story definitely kept me guessing. Everyone is keeping secrets and when I thought I had things figured out, I realized I didn’t. I was definitely surprised by how things turned out. Cathy is funny. As a stay at home mom, I could relate to many of her issues. She tends to jump to conclusions and makes up stories at the drop of a hat. Her mouth gets her into a bit of trouble. She also has an interesting group of friends that she likes to varying degrees. This was just an entertaining read that I didn’t want to put down. via WiLoveBooks: Review: Looking for La La by Ellie Campbell.